LONDONERS!!! 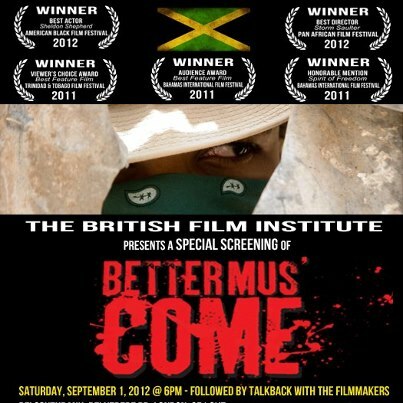 On September 1st, at 6pm, The British Film Institute will be presenting a special screening of award winning Jamaican film Better Mus’ Come at the Southbank. Director Storm Sauter, Pan African Film Festival winner for Best Director will be @ the screening for a talk back after the film. Also on the very next day, September 2nd at the Southbank at 4pm New Caribbean Cinema will screen the World Premier of Ring Di Alarm. Ring Di Alarm is 7 short films by 6 directors wrapped into one feature, which is centered about the issue of morality. Even though they were all shot in Jamaica in some way they tell a story that Caribbean people can identify with. Both of these films are a must watch! !